After a long time lurking, I finally decided to take the plunge into EVA Foam building of a SM costume. After seeing the fantastic builds here and the YT videos of folks like Pilerud's and Gary Sterley's builds, I knew I needed to do it. I've never done a Cosplay before, so that is another journey to head down! So why not just a standard SM? I feel like there are so few Termi builds out there, that I wanted to add another to the ranks of the Terminators before doing an SM build. The next decision is what chapter to chose... I'm a diehard Space Wolves fan. I played them back in 3rd Edition in the table top and I love their lore. I also love the Wolf Guard lore. The largest reason NOT to chose the SW's was because of their propensity to NOT wear helmets. Given that I am shooting for roughly 7' to 7' 6" tall Termi and there is no way I could grow the facial hair or my actual hair out far enough to do a helmetless SW, it was just easier to pick a standard SM chapter instead. The question then went to "To Deathwatch or Not to Deathwatch"... that is, indeed, the question. For now, I'm thinking not, since it'll be easier to weather just about any other color of power armor! Why the Excoriators? This is a bit more complex... the history of the chapter is great. They are not fully Codex Astartes compliant (bonus in my book ) yet their history and loyalty to the emperor is extremely deep. The other convenient aspect of the Excoriators is battle damage is NOT repaired unless it impairs the function of the armor. This gives me a REALLY good excuse to put significant battle damage on the armor and not feel guilty! This will definitely tax my artistic abilities since painting has never been a strong suit... neither my miniatures, nor any other models I've painted! Ok, so the files I'm using are listed inthe Pep Library and are credited, erroneously, to Ex1le but should be credited to Tango89er. They are fantastic files and are the same files being used by a few other Termi builds here! I'm making some tweaks to the build as I go based upon ease of creation of parts. 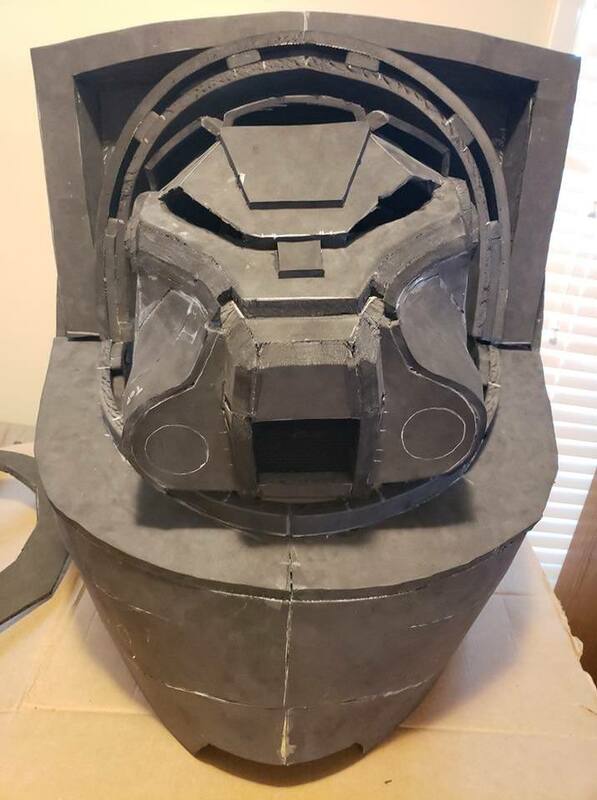 This build is using a mix of EVA Foam interlocking tiles in 1/2" thickness and 12mm and 6mm EVA foam from TNT Cosplay Supply in Texas. The helmet and torso are all using the interlocking tiles, the rest will be with the TNT Cosplay Foam. So where did the build begin? It began as me wanting to have a terminator helmet on my desk and what started innocently enough turned into a full blown desire to have the full suit of power armor! Well, that escalated quickly! So I DID start off making just the helmet, first out of paper using a the Pepakura files for the helmet. I wasn't overly satisfied with the paper and knew I'd spend a long time refining it before being satisfied enough to cast it in fiberglass. The logical progression was to go to Foam, so that's what I did. Once the helmet was done, the torso was next. I'm still not done with it as there are a lot of details to work out. I've also intentionally left the back vents out as I plan on doing in suit cooling. Either in the form of cooling fans or possibly a reservoir setup with a peltier cooling device to have cool fluid to run through a cool shirt. Lofty goal, but better to not install stuff that will interfere with that goal later on! Right now I'm working on the pelvis (as the files call it), the built setup. Since it's a key part of getting the scale of the armor correct, I wanted to make it so I could finish making modifications to the torso as it was evident from other builds that the chest piece did not have enough length to it. I'll have more photos to attach as the build progresses! If you guys have any comments or criticisms, please feel free to post! I do want to put a good amount of work into the build to make sure it is done well! If I'm going to take a full leap into Cosplaying AND into Space Marine stuff, I definitely want it to be worth the effort! Thanks in advance! I feel your pain, brother!! I'm new to the game also. Long time fan of Space Hulk and Death Wing. Never done anything foam or cosplay for that matter but thru 3D printing and finding a termie helmet , here I am. I started on the other side making some of the weapons (full size auto cannon). Maybe a little backwards, but its a start. Your foam work looks good IMO and its gives me ideas for when I start mine. All the threads on here have a lot of great info and some very talented people making these suits. I'll be watching your progress, keep up the good work!! Looking good, I will be following your build with excitement. Are you going full Space Marine size 7'+ with stilts or are you going to keep it normal human sized? I was wondering the same also. I got my files from here, but don't know the scale. Print out the template for one of legs, that is usually a good way to make sure the scale is correct for you. For my normal power armor build I printed out a lower and thigh template to make sure that I had the scale I was looking for correct. I am 7+ feet call in my armor, which is great from the perspective of being large but does limit mobility with 11-12 inch stilts. More progress to report! So at the end of the last "installation" I did work on the torso, and helmet and said I was starting on the pelvis/belt. Outside of some detail work, the basics are done. Time for photos! Front is pretty basic... I plan on doing a belt configuration similar to others have done on here with a more detailed belt assembly but those details will be done using thinner foam to get better details. The rear portion of the pelvis is such a pain in the... well... rear... and why is obvious due to the amount of steps in it... Some parts were cut through, some were just folded out of ease. Look at how far I had to cut into the center section to make it efficient to walk! So one thing I also mentioned was that scale was important to the overall build. Since I had the torso's large parts done and the pelvis large part done it was time to do a test fit. The results of the initial test fit confirmed what I had feared... I was going to need to lengthen the torso some. Part of this is because I have a particularly long torso relative to my height (6'5" or 195.5cm) with relatively short legs. Kinda perfect dimensions for a Terminator build as it meant that I could use whatever stilt height that was necessary to get the scale that I needed! As for overall scale, the entire build is a 10% overscale of the files here on OC so I'm guessing this will be above 7' tall, probably closer to 7' 5" tall but right now, not known! It matters very little as at the end of the day, overall scale and proportions are important to me vs an actual given height! That actually moves similar to the way medieval armor has overlapping plates that cover gaps in armor like that and I think it's a really cool idea that should improve mobility some and reduce the heavy material that reduces the suit's natural air flow. I plan on using the thinner foam that I have here to make those pieces and then I'll have to figure out how to make them move fluidly! I'm going to have to order more 12mm foam so that I can finish the legs and boots to start on the shoulders! Thanks for the comments, I definitely am hoping to live up to some of the better builds here! I have a lot of skills to develop as well since I have limited experience painting and weathering. I'll be using scrap pieces to practice on, same with battle damage! This is a 10% upscale of the files listed here... my guess is the original files are for a roughly 7' tall terminator. This will most likely be taller than that due to the upsizing some. My goal is to accomplish as much as possible without compromising the proportions. The overall height matters very little to me compared to getting it proportionally correct. I didn't want to go too big or small for fear of mobility issues and sizing issues! This is next on my list anyway. With the short legs I have (32" inseam at 6'5" tall! ), it should be very easy to get things correct for the leg sizing! Wont know how tall of stilts I'll need until I get the legs/boots done. All in due time! About to start on my own terminator build. Never worked with this kind of foam before and I'm wondering what glue you are using? I use Barge Contact Cement for mine but I also used some superglue on the helmet since it is less likely to need to flex much but the large pieces of the chest, etc, are all Barge contact cement! Haven't worked out how I'm going to do the internal structure so it is more rigid but will probably use aluminum stripping bent to shape. From what I've seen in other builds, pex tubing seems to be a good way of getting more structure. Pex worked great for my armor build and I even fell over in it at AwesomeCon two years ago and all of the Pex support held. I highly recommend it. I did use Aluminum strips for the joint at my knees but that was more for space (needed a thin joint on either side) than a worry that Pex would not hold. Here's a question for the OP or anybody else, did you use the paper files for the helmet or did you find a foam file?